Kong toys are the best dog toys… ever! They serve double-duty, as a chew toy and as a treat-dispenser. We currently have a total of 16 Kongs which our 2 dogs enjoy on a daily basis. Come along as I share some little-known facts about Kong dog toys and give you some creative ways to bring hours of joy to your dog… Kong style! Most pet owners are familiar with Kong toys. But if you’re a new dog owner …or a pet owner whose dog isn’t actively using the Kong chew toy …or someone who’s looking for new fun things to try inside a Kong toy… then you’ll appreciate this. 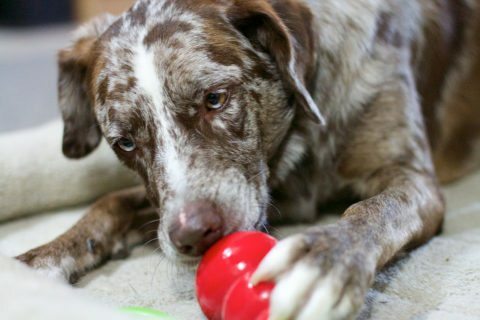 Here’s a detailed explanation of the different types of dog Kong toys — including exactly how the Puppy Kong is different from the Adult Kong, the Senior Kong, and even Extreme Kongs. Dental Kongs – a fetch and chew toy with unique ridges which hold dog treats, remove debris between teeth, and massage gums. Kong Jumpin’ Treat Dispensers – uniquely shaped rubber KONGS that bounce erratically and dispense treats from various ports. Air Kong Tennis Toys – have 100% tennis ball cover to make them soar through the air farther and even float in water! 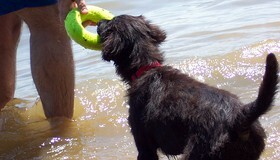 Kong toys satisfy a dog’s inborne, natural desire to “work” or hunt for food. Stuffed Kongs can keep them busy and content (and out of trouble!) for long periods of time by encouraging them to get the food reward inside. For dogs with separation anxiety and other behavioral issues, Kong toys provide a form of therapy/behavior modification. A Kong dog toy serves to distract your pet from whatever the “problem behavior” might be. I (and my friends) have found that this really works! A Kong is a unique dog toy that exercises a dog’s mind, at the same time that it gives a dog the satisfaction of a job well done. For dogs who remain alone for long periods of time (say, while you’re at work), Kong dog toys provide a form of entertainment and prevent boredom. Regular use of Kong chew toys can improve your dog’s oral health. While playing with the Kong, the rubber toy naturally works its way into cracks and crevices between your dog’s teeth, effectively removing plaque and food particles. Kongs are quite effective when used as a training device… to break “bad behaviors” and teach “good behaviors”. Since Kong toys can be filled with a wide variety of “goodies”, your dog will always look forward to the opportunity to find what’s inside. As a result, it’s a toy that your dog never gets bored with. For dogs who are living a sedentary life, a Kong toy will entice your dog to play more and be more active. The Kong’s unpredictable bounce lures most dogs into a game of chase, catch and chew — especially when it’s filled with food treats! For those who are crate training, or whose dogs remain in a crate long hours while you’re away, Kong toys can help a dog feel more comfortable while being crated. It’s as if the dog receives immediate gratification — a positive reward — while being crated. Kongs grow with your pet. There are a variety of sizes and styles to accommodate even the youngest puppies and full-grown dogs of all shapes and sizes. The Kong toy was created after Joe Markham was working on his VW van one day, while his German Shepherd, Fritz, was chewing on rocks nearby. In an attempt to break Fritz of his rock chewing habit, Joe tossed spare car parts — like radiator hoses — near Fritz to see if he could be coaxed away from this destructive behavior. The only thing that worked was a spare suspension part… which ultimately led to the invention of the Kong dog toy! The key to the Kong’s success is its hollow center which can be filled with dog treats, then washed out and reused. For the record, I’ve never seen a dog find much enjoyment from a Kong toy that WASN’T filled with treats. 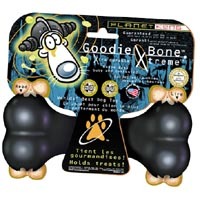 The ability to place dog treats inside is what makes this toy so effective, and so well worth the money. Dogs LIKE to hunt for food… They are born this way. Not only is it physically and intellectually challenging for the dog, the act of hunting effectively becomes their primary form of “work”. And the reward for a job well done?… some food at the end. You could even add more (than one) stuffed Kong toys into a dog’s daily routine to increase their “work time”. Kongs require very little maintenance or care. They are so durable… virtually indestructible… they can even be washed on the top shelf of your dishwasher. What could be easier than that?! While Kongs are built super-tough to withstand years of chewing, certain large-breed dogs have been known to destroy even the hardest Kong toy, including: Mastiffs, Rottweilers, German Shepherds, and Labrador Retrievers (…though our Labs haven’t even made a dent).